Carry bonefish flies in various weights. Sink-rate is the most important factor in a bonefish fly. Bonefish are (usually) bottom feeders. That’s where their prey lives—crabs, shrimp, worms, clams, mud-minnows, etc. You want your bonefish fly to sink quickly to the bottom, in 2-3 seconds. This is especially true on sandy flats. Your fly should already on the bottom when the fish reaches it, so that first strip makes it look like the natural behaviour of frightened prey. If your fly sinks too slow the bonefish can literally swim under it. WADING vs SKIFF: In most bonefish destinations—Florida Keys, Bahamas, Belize, Mexico—you’ll be fishing from a skiff, which means slightly deeper water than wade-fishing. This is where flies like the Gotcha, Crazy Charlie, Clouser Minnow and Merkin really shine. They are generally heavier patterns (as sold by most flyshops) and will get down to the fish quickly in 2-3 feet of water. Wading usually requires lighter bonefish flies, since you’re in shallower water, often mere inches. Bonefish in wading scenarios are often the most exciting, tailing and feeding aggressively. However, they also require a more delicate presentation, and therefore a lighter fly. The flies mentioned above still work, but they need to be tied with tied with bead-chain eyes rather than lead dumbbells. In extreme cases—say calm water, no wind and tailing fish—you might even want “blind” patterns with no weight at all. However, bear in mind that most bonefish flies are actually designed to ride hook-point-up because of how the eyes are tied on. Removing the eyes means the fly will flip over, riding point-down. In areas where there is lots of grass, that means you’ll need a weedguard. Perfect for shallow, grassy flats. Really thick turtle-grass flats requires an entirely different type of bonefish fly. Turtle grass flats are found in the Cayman Islands, Honduras, Belize, the Florida Keys and some parts of the Bahamas. Unlike conventional bonefish flies, these flies need to sink slowly, giving the fish plenty of time to see the fly before it gets lost in the grass. These flies also need weedguards or they will catch grass, hang up and spook fish. 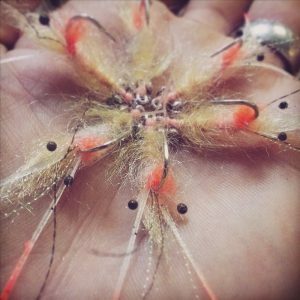 You can still use traditional bonefish patterns like Crazy Charlies or Gotchas, but you’ll want them tied with small bead-chain eyes. You’ll also want to tie them on smaller hooks than usual to eliminate weight—say, a #6 instead of a #4. Match a Variety of Species. A significant of their diet is clams and worms, neither of which is known for speed. Bones also feed on crabs and shrimp, both of which are very mobile, but these pray species tend to hide when threatened. Ever walk along a shoreline and seen crabs dart out toward deeper water? They only swim a foot or so then dive to the bottom and hide. If the bottom is soft enough they bury themselves. Shrimp utilize a similar strategy, darting at the approach of danger and then holding still to hide. But, sometimes they keep up a continuous, darting retreat. Mud minnows also dart from danger, and these are what many guides think bonefish are eating on Bahamas sandy flats. They are also common around coral-rubble flats throughout the Caribbean where short, continuous strips will often entice cruising bones. The Strip-Tease Bonefish Fly, perfect for sandy flats and picky fish. As you can see, some flies work for both. Charlies, for example are suggestive of lots of prey species, from shrimp to sand fleas to minnow and even tiny crabs. However, not all flies can be fished the same way. 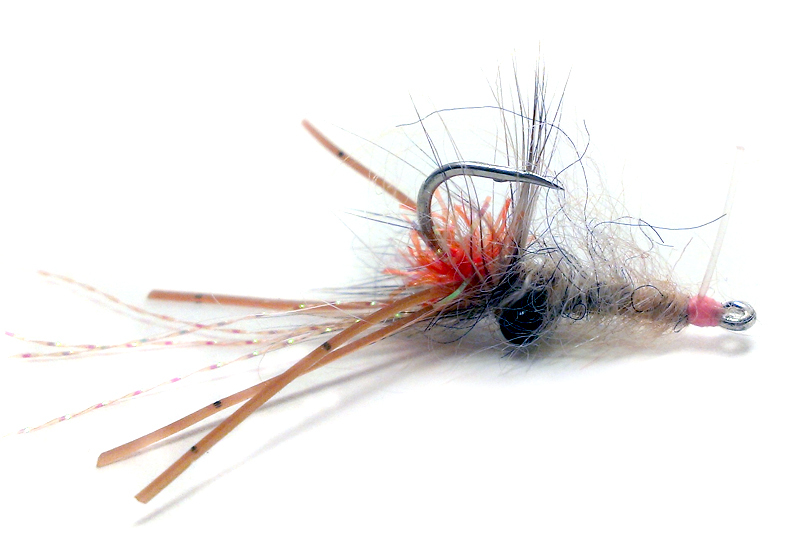 Crab flies, for example, often spin when stripped too fast, putting spooky fish off the bite. That’s why a crab fly works best with a slow strip-and-stop retrieve, watching the fish for the pickup. 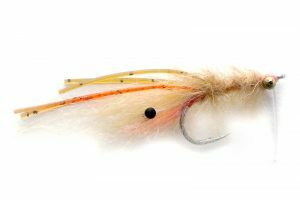 Clousers, on the other hand, work great when stripped quickly, and have an enticing jigging action when fished with a staccato strip-stop-strip-stop retrieve. However, they don’t work as well lying on the bottom. Again, some flies work well for both, usually patterns with lots of realistic elements—rubber legs, eyes, splayed/defensive posture, etc. These elements are convincing when a fly is left to sit on the bottom for the inspection of a picky bonefish. However, unless incorporated correction, they can make a fly ride sideways or spin when stripped too fast. That’s why only a few flies work well for both types of presentation. The Bonefish Junk, Strip Tease, Kung-foo Crab and The Usual are examples of this versatility. They can all be tied with lead dumbbells or bead-chain, and track straight when stripped. Of these The Usual is probably the best for delicate presentations to tailing fish, since it’s tied from softer, fuzzy materials that lessen the impact. with weedguards and big profiles. As discussed, not all flats are the same, and that means the fish on those flats will feed differently. For example, over sandy bottom a bonefish fly will silhouette very well, so bones can see it from maybe 10 feet away. Also, on these flats the pray is more likely to run than hide, since there is little structure to hide behind. (The exception to this is crabs, which will try to bury themselves in the sand. So, crab flies can still be fished with a strip, stop retrieve, and watch for the pickup.) This is why classic flies like Gotchas and Crazy Charlies work so well over sandy bottom: they are great when stripped and have a strong silhouette. They are also usually heavier because you’re casting farther ahead of the approaching fish and the fly needs to be near or on the bottom before the fish sees it. On the other hand, grassy flats call for very different flies. Imagine a knee-deep turtle grass flat. Now imagine that the grass is ankle height. That leaves a window of about 12-18 inches over the grass for the bonefish to see your fly. Once the fly sinks into the grass it’s lost. Also, the fly won’t silhouette over grass the way it does over a clean, sandy bottom. That means it’s harder to get the fish to see the fly. Finally, fish simply can’t see as far ahead in those conditions, so the fly has to be presented a lot closer to the fish in order to get them to see it. This calls for much lighter flies that land quietly. 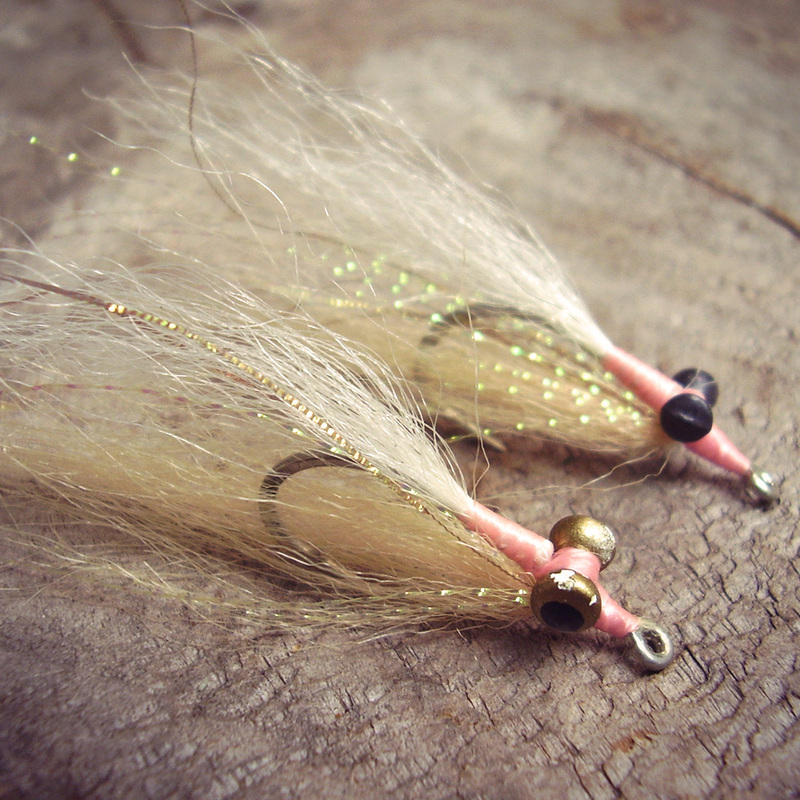 Simple Shrimp Bonefish Fly, perfect for tailers over grass. Bottom line: you don’t have to carry a hundred bonefish flies with you. You just need a variety of weights, sizes and shapes. Get them with weedguards if you can—you can always cut them off, but they’re hard to add—and make sure they’re tied on strong hooks. Given variously weighted shrimps, crabs and minnows, I feel confident about catching bonefish almost anywhere in the world. What’s your favorite bonefish fly? SEE OURS HERE. Think we left something out? Share with us in the comments below.